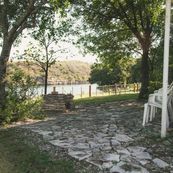 The headquarters and riverfront cabin lie on the banks of the South Llano River, surrounded by a stand of large live oaks. 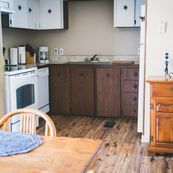 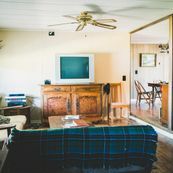 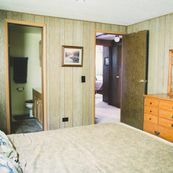 The cabin is rustic and comfortable, with enough room for two families looking to get away from the city and enjoy the serene waters of the river and the rolling countryside. 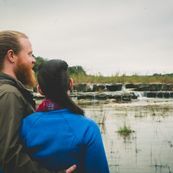 Three generations of Vandivier have stewarded this land and continue efforts to restore the forest, streams and grasslands to their native state. 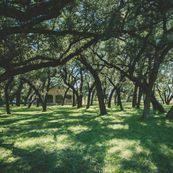 The ranch has received numerous state and national awards for the land stewardship, including the prestigious Leopold Conservation Award for using sustainable land-management practices. 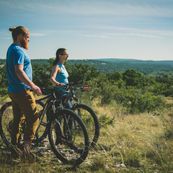 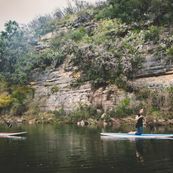 Tucked in the South Llano River valley among the limestone cliffs, the Llano Springs Ranch is a private oasis, complete with its own waterfalls and the spring-fed Blue Hole. 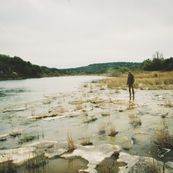 "It's an absolute dream come true. 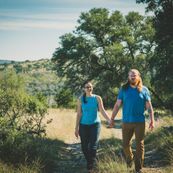 This ranch is a place for the family to convene, enjoy and share with other folks."